Ask fellow campers about "Rochester / Marion KOA" and nearby attractions. I was at another park previously since I am a Mayo patient and left because of lousy park conditions and horrible management. I checked in and what a difference in attitude and overall park conditions. Would definitely stay again. We camped at Rochester / Marion KOA in a Motorhome. Mayo clinic is all that I saw. We stayed overnight to attend a wedding. The sites are close but manageable. The utilities all worked well but to this 90 year-old marine the staff was friendly and helped me park my rig. I will definitely return when I have Mayo appointments. We camped at Rochester / Marion KOA in a Motorhome. We had a pull through site at the back of the main office, it was very easy to get into with shade and lots of room. We camped at Rochester / Marion KOA in a Travel Trailer. Not much at this exit off the I90 but easy to get to. We attempted to stay at this KOA in a 35 ft. travel trailer with a long box truck. The road and sites were extremely hard to navigate. The roads are curvy with rocks and trees in places that make it difficult to drive through. I initially booked a back in site but they changed it to a pull through. The site was difficult to get to and when we complained the people running the campsite and asked for a back in sight they would not give us one. It took a lot of back and forth to get our camper out without scraping against the rocks and trees. We did get a refund and had to go find another place to camp for the weekend. We camped at Rochester / Marion KOA in a Travel Trailer. Large trees, pool, laundry, clean restrooms and showers. Park split by local little used road. Pool on one side and all other services across road. Extremely tight corners with rocks, poles and signs and trees to avoid. Some areas flood with rainstorms. We camped at Rochester / Marion KOA in a Fifth Wheel. Enjoyed our 2 nights. Very clean park and close to Rochester. Gave us great advice to get on the bike trails. Much appreciated. We camped at Rochester / Marion KOA in a Motorhome. We stayed here one night as we traveled through Minnesota. It's a pretty park with lots of trees and grass. The park is kind of cut in half by the road. The office building and some of the RV sites are on the right side of the road as you come down the street, and the pool and other camping sites are on the left inside of a fence. The staff was extremely helpful and kind. Terrific people! We had a medical emergency and one of them drove us to the hospital so we wouldn't have to pay for a taxi. My daughter loved the pool and the playground. There were several large balls and other pool toys available for the kids to play with. We camped there in a motorhome. We camped at Rochester / Marion KOA in a Motorhome. NOT BIG RIG FRIENDLY. Trees caught the top of our rig when we checked in, but we made it and they said they would trim them. It rained over night the site flooded with water, and the next day when leaving the trees damaged our rig. We struggled to get out of the campground and they never once offered to help. The management acted as if it were our fault and took no responsibility in maintaining the trees. My guess is they sell the walnuts and didn't want to lose any by trimming them. Unfortunately, now they will have an insurance claim because it. Nice place but I was very disappointed in the management and their lack customer service. Our experience in the midwest has been so good - I hate this put a damper on it. We camped at Rochester / Marion KOA in a Motorhome. If you want to accommodate the bid rigs you have to maintain the roads to the sites. We stayed here on our way home. The campground is easy to get to and yet far enough off the interstate to avoid all the traffic noise. We had a back in site, but the site behind us was open so the host just had us drive through. We didn't even bother to unhook our tv, so we would be ready to leave in the morning a little faster. The main office and showers are across the street from most of the camping sites. It is an odd configuration, but the street is a quiet residential street with no real traffic on it. We camped at Rochester / Marion KOA in a Travel Trailer. Not a big fan of KOAs but they are convenient, however, do not stop at this one. Supposed to be quiet but you hear road noise. Stayed in the back behind the office, hard to get into and out. The man "guide" was not helpful and very rude when asked questions. Also, on the last night of a three day stay the lady "guide" was trying to park at least a 30 foot pull trailer on our drivers side and had I not honked my horn he would have crashed into our mirrors and front side. They had to pull out two split rail fences so he could make the turn and pull out and leave. Very scary!!! We camped at Rochester / Marion KOA in a Motorhome. Dinner at local resautants are very good. Lots to see and do. Despite my husband indicating we had a big rig, they assured us they could accommodate us. Not so. Not big rig friendly at all. Very tight corners in park with large boulders at corners. No room to maneuver. Front desk person was also quite surly. We would not stay at this campground again. We camped at Rochester / Marion KOA in a Fifth Wheel. 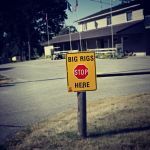 Big rig friendly with level sites. Showers and laundry were good. Wi-if was good most of the time. Dog park was good and bags were provided. Grass needed to be mowed inside and around the dog park. No problem with our satellite after we moved to another site. Did not use the pool. We camped at Rochester / Marion KOA in a Travel Trailer. Walmart and shopping was about 2 miles. Easy to get to Rochester which was 8 miles. Mayo Hospital was huge and all over the city. The free subway and skyway was a great place to get around especially during winter. Lot of campers used this campground to go to the Mayo Hospital. We stayed in the lower part of the campground. Lots of traffic noise. Make sure you use THEIR wood. We camped at Rochester / Marion KOA in a Travel Trailer. We hadn't planned on staying in the area but all the parks in the area farther west were booked because of the Sturgis Bike Rally so we took a chance and dropped in here. The lady at the counter was very friendly and was happy to find a full service, pull thru site for us for the night. She guided us to our site which we really like rather than trying to find the site on our own. The park is far enough off I-90 that noise is not a problem. The laundry room was clean ($2.00 for washer & dryer). The office was well stocked with basic supplies. Wifi worked well. We enjoyed our stay and would definitely stay here again. 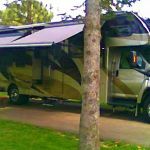 We camped at Rochester / Marion KOA in a Fifth Wheel. We stayed 2 nights. The park was very clean and was very restful in our site (which was up against the fence). The people across had a large screen TV on the OUTSIDE of their RV which was very distracting. At least they kept the sound within their site which was very courteous. We camped at Rochester / Marion KOA in a Travel Trailer. You will have to purchase firewood at the campground. The manager is very adamant that you can not bring in any wood. She wouldn't even let us bring in would that was DNR certified in Rochester! Other than that, she is very, very nice and accommodating. 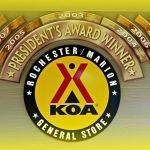 Are you affiliated with Rochester / Marion KOA ?